Northampton Saints prop Alex Corbisiero and Leicester Tigers lock Geoff Parling will miss England's autumn internationals because of injury. Corbisiero, 26, suffered a shoulder ligament tear during Northampton's win over Bath on Saturday and is not expected to return until early 2015. Parling, 30, will be out until December following a concussion. England head coach Stuart Lancaster is already set to be without Mako Vunipola, Dan Cole and Tom Youngs. Parling had to be withdrawn during Leicester's 45-0 defeat by Bath on 20 September. 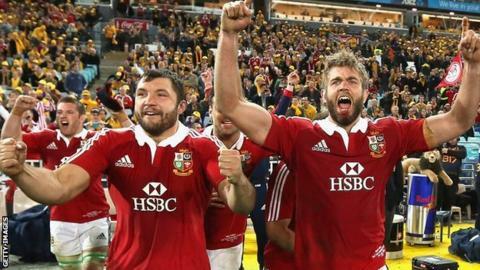 He has been capped 21 times by England and played a part in all three of the British & Irish Lions' Tests against Australia in 2013. "Geoff saw the relevant specialist this week and will have time out of the game now," said Tigers director of rugby Richard Cockerill. "He'll probably have three or four weeks of complete down time and then he'll be reintegrated into training. "You'd like to think that by December he'll be playing again. And there's no doubt about that, he will play again. There are no issues over that." Corbisiero missed a large part of last season - his first with Northampton - because of a serious knee injury, but took part in their successful end-of-season Premiership play-off campaign. Having been forced off during Saturday's win over Bath, Northampton director of rugby Jim Mallinder initially told BBC Radio 5 live that Corbisiero should be fit to face London Irish this weekend, describing the injury as "hopefully just a stinger". The loose-head, capped 19 times, has not played a Test for England since the win over Argentina last November and missed the entire 2014 Six Nations campaign and summer tour of New Zealand. Lancaster's side will play four Test matches during November, against New Zealand, South Africa, Samoa and Australia. England's 2015 Six Nations campaign begins on Friday, 6 February against Wales.